As promised I am doing a second movie of the week this week since I missed last week. Now since the movie I posted yesterday features some kind of depressive subject matter, I decided to turn to a film that will have you in stitches if you are a fan of Bill Murray’s humor. It is a kind of humor that only Bill Murray can deliver whether you think of it as quirky, mature, intelligent, or even simple. Whatever adjective you pick I think most would agree that it is difficult to watch of his movies and not laugh. 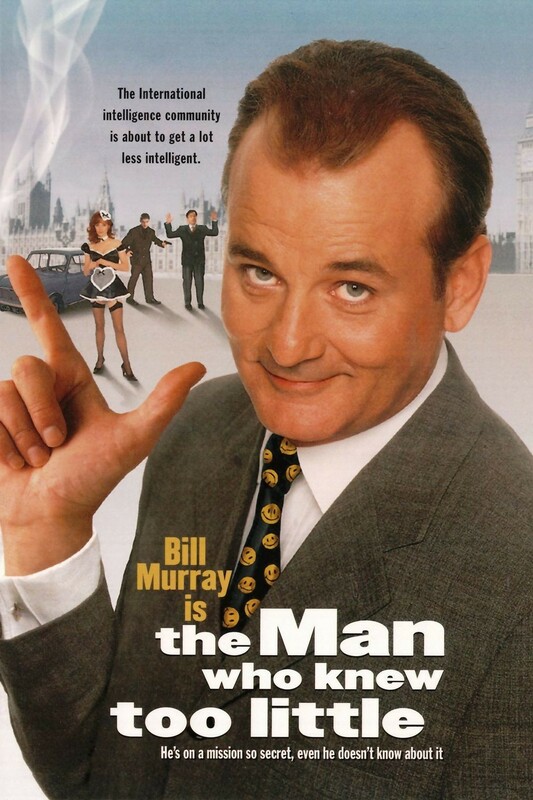 Anyway, this week’s random movie is one of Bill Murray’s slightly lesser known films The Man How Knew Too Little. This movie seems to have a love of Murray fans torn but I love it. Yes the story is something familiar of two people being mistaken for each other has been done before but I just found myself truly laughing out loud as some of the things Murray was saying because in a way it pokes fun at the espionage and crime genre. Being in the spirit of the improve theater he thinks he is a part of, Wallace does everything that he believes is expected of his “character” to do. Best of which is when he fires a warning shot and afterwards asks how they knew where to make the bullet look like it hit (I know that may not read right but when you see the movie you will get it). Not going to lie before watching this movie I expected his character to be just plain stupid and thought it would be a lot of dumb humor but I was pleasant surprised that he was instead plain blissfully ignorant to the true danger of the mix up he had been caught in. Overall, I really like The Man Who Knew Too Little. I do not know why more people are not aware this movie exits. Probably because Murray is the only well known actor in it and the direction and all that other artsy film stuff is lacking but there is no denying how funny this movie is. I give it an 8/10. I have been meaning to write about this movie for a while just never seem to get it done. With my DVD collection steadily increasing in size, whenever I am reorganizing the shelves to accommodate the new purchases I always kind of chuckle when I come across some of my earliest purchases. I remember buying my first DVD player and getting to pick two DVD’s out of the five-dollar bin for free. Being so early in the DVD generation, the selection was very poor and mostly consisted of films I have never heard of so I had to take a gamble. 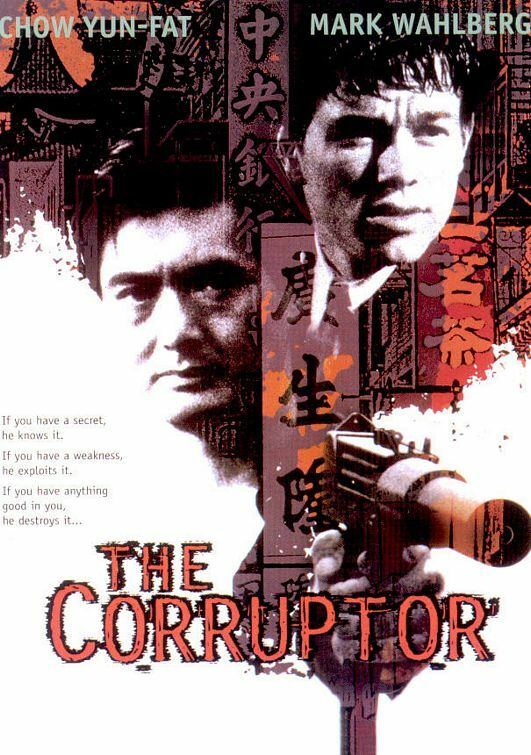 One of the films I picked up is this week’s random movie, The Corruptor. Let me just say that this movie is far from being great but it is definitely underrated. The idea of corruption and battling gangs is far from original but that does not make it less entertaining. I has its share of twists that keep the story moving along but I will say that at times it gets hard to follow. Between whom the corrupt cops work with and who they do not and what gang members are loyal to which gang. At least I at times struggled with this the first time I saw it. I get it now of course but initially I found myself rewinding the DVD to see if I got it the second time. Also if you consider yourself a Mark Wahlberg fan this should be right up your alley. He makes his usual snide remarks in that Boston accent in spite of being a New York City cop and has at least one shirt-less scene. Chow Youn-Fat is good as usual in this one as he plays the at times psychotic Nick Chen whose loyalty is also tough to judge while watching the story unfold. Overall, The Corruptor is worth at least a watch especially if you consider yourself a Mark Wahlberg fan. I must say the thing I probably like most about this movie is the music, which is not necessarily a good thing when you’re talking about an action movie. I give it a 6/10. By the way, since I missed last week’s random movie I will post another one tomorrow to make up for it. I think it is safe to say that most people feel there are just not enough hours in the day, week, or even month to do all the things you want and need to do. Everyone think about how if they had a clone, they would make the clone do all the work while you relaxed, doing the things that you wish you had more time do. But something is rarely considered is how would that clone feel about this arrangement? If it were a perfect clone where it thought and acted just like you, wouldn’t the clone want the original you do all the work too while he/she relaxed? Or if there were a subtle difference that made your ideal arrangement okay with the clone, who is to say what the people around you would say. Maybe they would prefer the clone over the original. I am obviously over analyzing the sci-fi situation but these are questions I began thinking about after this week’s random movie Multiplicity. This is just a plain fun Harold Ramis comedy. It has that witty and quirky humor that I tend to associate him with. There are not necessarily any great one-liners but there is great banter and hysterical situations that are sure to make you laugh. Now being that this is a comedy more than anything else, there are obvious flaws in the logic of how Doug is able to mask the one, then two, and finally three clones camped out in his guest house and how there always manages to be a car available to all of them. But when watching it you really do not think of it that much because it is such a light movie that is meant to be fun. Now as you probably figured, this movie will only be as good as its lead actor, Michael Keaton, performs which is great. As I mentioned in a previous post I feel he is extremely underrated as an actor. Now this is not like Eddie Murphy, Mike Myers, or Tyler Perry who when they play multiple characters in a film they all look drastically different. Granted the clones are all a tad different one being slightly more macho, another a little more in touch with his sensitive side, and the third… well being a clone of one of the other clones has some special needs but still is the same Doug. And watch Keaton embody each of these personas is just so much fun to watch and for 1996 is really looks like there is four Michael Keatons in the room. 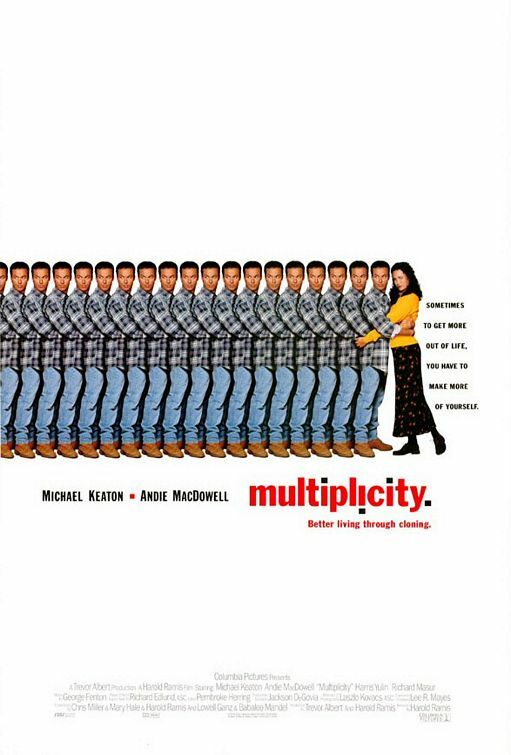 Multiplicity is a fun comedy that does not dwell on its sci-fi cloning implications but definitely presents a unique take on the often toyed with thought of “what would I do if I had a clone?” I give it an 8/10. If you are looking to watch it for free and legal means to watch this online, click here to watch it on Crackle.com.